UC Irvine School of Medicine researchers have discovered the mechanism by which bacterial toxins that cause food-borne botulism are absorbed through the intestinal lining and into the bloodstream. Their study, which appears in the June 20 issue of Science, points to new approaches to blocking this poisonous substance. Botulism is a rare and often fatal paralytic illness due to a neurotoxin produced by Clostridium botulinum bacteria, which can appear in rotted, uncooked foods and in soil. Listed as a Tier 1 agent by the Centers for Disease Control & Prevention, the botulinum toxin is also a potential biological weapon. Using a crystal structure of a complex protein compound of botulinum neurotoxin, Rongsheng Jin, associate professor of physiology & biophysics at UC Irvine, and collaborators found that these compounds – called clostridial hemagglutinin (HA) – bind with epithelial cell proteins in the intestines of patients, which initiates a process that disrupts the close intercellular seals so that the complex toxin molecules can slip through the epithelial barrier. "Normally, botulinum neurotoxin molecules are too large to break through this tight junction of epithelial cells," Jin said. 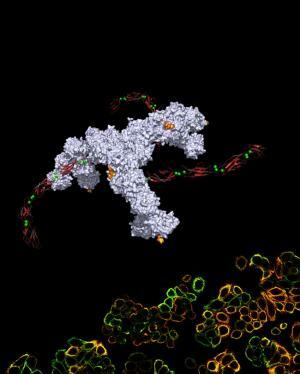 "By identifying this novel process by which the toxin compound manages to open the door from inside, we can better understand how to seek new methods to prevent these deadly toxins from entering the bloodstream." In further tests, he and his colleagues designed a mutated version of the botulism compound, based on the novel crystal structure, in which HA would not bind with the epithelial cell protein E-cadherin. Remarkably, even though this lab-made toxin compound contains the fully active live toxin molecule, it was not orally toxic when tested on mice because the mutated HA cannot break up the intercellular seals and, therefore, the toxin compound cannot be absorbed through the epithelial layer. Jin said this approach could lead to the identification of small molecules able to stop HA from binding with epithelial cell proteins, thus preventing the toxin invasion.